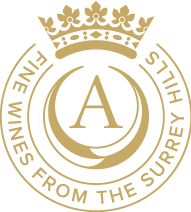 Our 2014 vintage will be released at the beginning of May and pre-orders will be available to collect from the vineyard (or delivered within the UK) from the weekn commencing 6th May. Our biodynamic sparkling wine (as seen on Countryfile!) is made using the traditional Champagne method. We only produced 260 bottles of this very special limited release which is made from 100% Chardonnay grapes. It was fermented using wild yeasts found naturally on the vineyard, which gives the wine a unique sense of pace or ﻿terroir﻿. You can read more about how this wine is made in our blog.